CRD stands for Car Research & Development and it’s a company in Brabus group which apparently tales care of anything non-Mercedes in there! 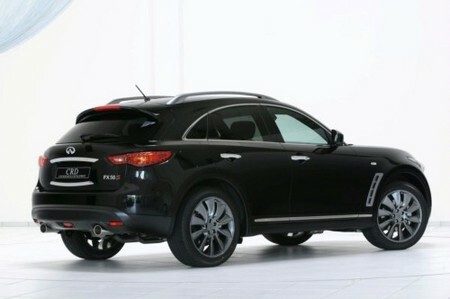 They also had their own stand at 2009 IAA with this customized Infiniti FX. The odd looks of 2010 FX is emphasized in CRD’s package for the car which mostly consists of dark gray chrome accents for the exterior parts. You get them on the front grille, those nice air ducts on the front fender, on the roof carrier and on the big rear hatch. 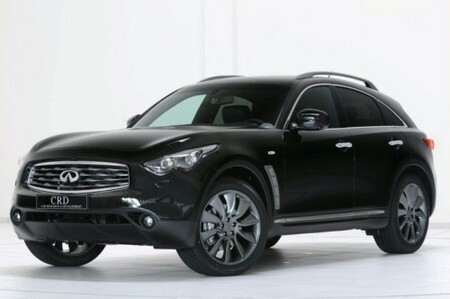 But the most striking part of CRD 2010 Infiniti FX should be the massive 21 inch turbine-design light-alloy wheels which come in the same color as the other accessories garnishing the car’s body. There no changes to the car’s standard engine which is a 5.0 liter V8 developing 390 hp. But you can have the CRD in white paint job as well! There is also an extensive program for the interior. In order to make a sport and luxurious cabin, the upper part of the dashboard as well as the upper parts of all four door panels are covered with the finest leather in the company upholstery shop. There is a two tone brown/black leather trimming here which makes a nice atmosphere in combination with new carbon fiber parts.